Coconut Oil vs. Sesame Oil? The Daily Swish has both, plus it’s infused with Ayurvedic herbs and peppermint and spearmint essential oils. The Swish and I have a standing appointment each morning because it turns oil-pulling into a delicious experience. Good things come to those who scrape. This scraper is perfect for reducing mouth bacteria, detoxing the tongue, and stimulating digestion. Ditch your plastic scraper, and upgrade to high-quality stainless steel. The moisturizer that rocks my world. Organic ghee, coconut oil, shatavari and ashwagandha root, fennel seed, rose geranium oil, and more. My skincare motto: if I can’t put it in my mouth, it doesn’t go on my skin. A traditional formulation of three (tri) fruits (phala), this is a staple item in the Holzman house because it removes excess Vata, Pitta, and Kapha and supports digestive, respiratory, and circulatory health. It’s like an Ayurveda one-a-day vitamin. And, because I’m a frequent air traveler, this is my go-to when I am feeling irregular. From premium health food markets to Indian specialty stores, I’ve searched high and low for ORGANIC, hulled, mung beans (aka Mung Dal), and Banyan is the only place where I’ve found them. Kitchari is a delicious, nourishing, detoxifying, Indian comfort food of which mung beans are a key ingredient. They are also the only beans in Ayurvedic medicine that don’t cause gas. This Vata-soothing combo powder contains herbs that are grounding, heating, and oily: Cumin, Pippali (Black Pepper family), Fenugreek, Ajamoda, and more. In the winter or on a long flight, a 1/4 teaspoon in a cup of hot water enkindles digestion, stimulates appetite, and calms excess air movement in the body. Use promo code: HOLZMAN15 for 15% off. Guys, we deserve some cool yoga duds, too. Innovative and multi-functional, Vuori’s designs are eco-friendly, odor-resistant, and fast-drying. In the yoga studio or in the water, it’s one short for every sport. 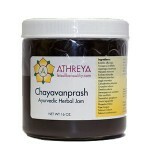 An herbal jam that rejuvenates all the tissues of the body? Yes, please! Chyvanprash strengthens the heart and respiratory system, builds immunity, increases overall strength and energy, AND it tastes great. An ancient Ayurveda formulation with nearly fifty nutritive herbs cooked in a base of Amalaki fruit (high in Vitamin C and anti-oxidants), one daily teaspoon with hot water keeps my brain and my digestive fire burning bright. I’m a Chyavanprash snob: Athreya’s leyhams (jams) are second to none. Step away from the Protein Powder! Ashwagandha is a chewy jam elixir that naturally builds strength, muscle tissue, immune function, stamina, male fertility, libido, energy, focus, the kitchen sink. It even heals the nerves. Like Chayvanprash, it’s a tonic that I take daily with a little hot water or milk. Pure nourishment in every jar. entire mouth and freshening the breath. 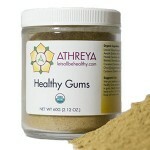 Simply apply to gums with a wet finger or a toothbrush, massage; let it sit for 5-10 mins, and rinse with warm water. This is an all-natural, oral care game-changer. The Nose Knows! All orifices need daily nourishment and lubrication, but the nasal passages require extra love. The repetitive friction of daily breathing causes excess heat/dryness, irritating the cilia in the nose and making us susceptible to infections and congestion. Himasagara -a cool, Pitta-pacifying thailam (oil) - is perfect for the nasal canal. Pre-airplane and during all four seasons, permission granted to place a well-oiled pinky in your nose. Another orifice, another opportunity to oil up! This ear oil has been distilled 101 times using the original ancient Ayurveda method. Vata dosha naturally lives in the ears, making them vulnerable channels for Vata-aggravation. For the prevention of colds and infections--or if it’s chilly, windy, or dusty--I place a few drops on my fingers and apply this silky salve inside and outside the ears for warmth and protection.